Running a business is complex, especially when it’s unclear who is responsible for what. To move your business from an informal organization to a well oiled machine, you need processes. There’s no getting around them. This makes processes way more useful because you can add accountability to your business systems. In this post, I’m going to go through some use cases you might want to try based on real processes we’ve put together at Process Street. 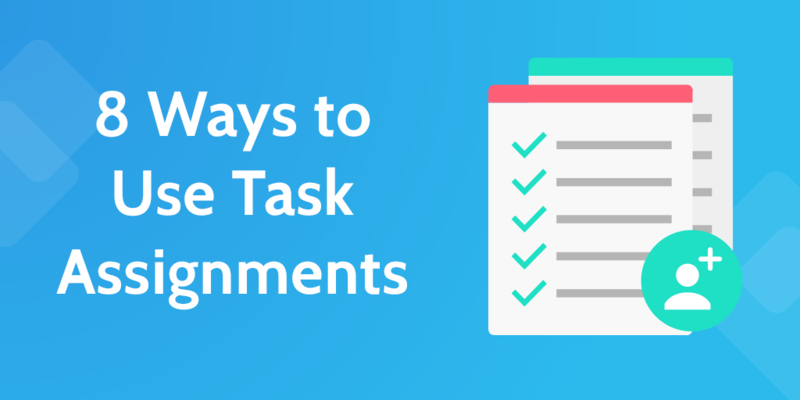 Task assignments can either be done per template (assign the same people to tasks in every checklist) or on the fly (assign people to tasks as needed). As with any new feature, there are tons of ways to use it. Need some ideas to get you started? It’s rare that processes can be run through from start to finish without any kind of hand off, especially if they’re complex like employee onboarding. With task assignments, you can now add mentors, department heads, HR staff and other key players to the process to make sure everyone knows what they’re responsible for. When you’re putting out regular episodes of a podcast, you need to have your processes in order. In my experience with the Business Systems Explored podcast and my own efforts, everybody needs to be 100% responsive, ready, and assigned to their duties… or everything’s going to go wrong. The different stages of our podcast publishing checklist can be broken up and assigned to assistants, editors, or marketers. Use task assignments to make sure everybody’s on the same page. It’s proven that repurposing is an effective strategy that can give your content more visibility across different platforms. For example, you can turn a blog post into a video, slideshow, PDF file, or even a string of tweets. 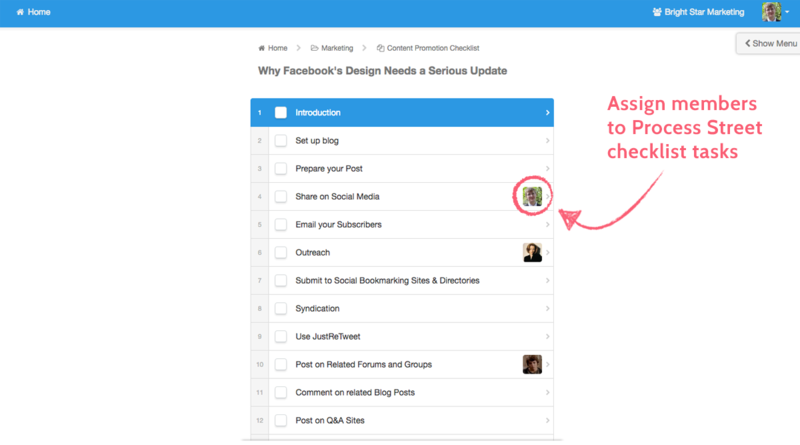 Using our content promotion checklist, you can assign assistants or designers to repurpose your content and get more exposure. Are your team struggling with a particular Process Street feature? It’s a great idea to run a checklist from the Process Street User Guide and assign your team to tasks to make them accountable. You could even make our user guide part of your employee onboarding process to ensure everybody gets up to speed with the tools you use as quickly as possible. Onboarding a new client is delicate work. You want to make sure the stage is set for a valuable relationship, and so using a checklist is the most foolproof way to do it. Add account managers to tasks like the kick-off call, assign reports to assistants, or even add in your office cleaner to come and tidy up reception to prepare for the client’s arrival. As we’ve looked at before on the Process Street blog, testing is a vital part of development and accountability plays a huge part. Build that accountability into your process by assigning tasks to testers and asking them to report back inside Process Street. Launching a website? There’s more to it than making sure the code itself doesn’t break. Assign your content writer or copy editor to the checklist below to make them responsible for checking your site’s copy before making embarrassing mistakes when you decide to launch. You could also do the same thing for the whole team working on the launch; a designer to make the favicon, marketers to approve the SEO, and data wizards to set up proper analytics. Task assignments aren’t just relevant in the business world. You can assign your children and significant other tasks to do around the house, too. Use the cleaning checklist below to divide up the weekly cleaning duties and make everything a little more manageable. With the pressure of viewings, staging, and negotiating, realtors should delegate tasks to avoid burnout. Listing a property is basically filling out a form on a web page, so can be easily delegated to a junior staff member. Use the real estate sales process checklist below to take the data entry out of your job, and focus on making the sale. Need more help with your business processes? Now you’ve got the inspiration, it’s time you learned to implement it. If you’re stuck, go check out our help article on task assignments, or shoot an email over to [email protected] and we’ll be happy to help! Haven’t got a Process Street account yet? Sign up here.